Every year, hundreds of disasters, both natural and man-made, occur across the United States. There’s no telling when or where a disaster will strike, so it’s extremely important to be prepared both at home and while on the go. Whether you or a loved one has mobility problems or a hearing, learning, seeing or any other disability, it’s vital to make an emergency plan and stock up on necessary emergency items. We’ve come up with some essential disaster readiness tips for people with disabilities to help you get started. Emergencies like fires, floods and man-made disasters can begin in an instant. 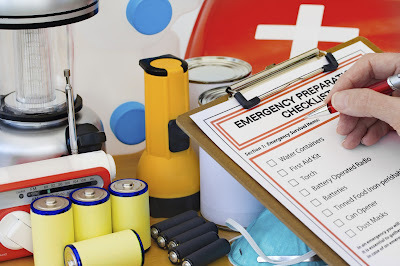 Protecting yourself and your family during unexpected emergencies requires planning ahead. Including family members, friends and co-workers in your plan is ideal – you should not depend on one person alone. Work with your support network to create plans for everywhere you frequently spend time, including your home and the office. If you require regular services, make a plan with each service provider. Decide how you will contact and communicate with your emergency network before, during and after a disaster – remember you might not have power or access to a cell phone. To make a plan, you should first get informed and educate yourself about what types of hazards are most likely to impact your community, as well as what current community assistance programs, warning systems and disaster plans are in place. If you can’t or don’t drive, find out what your community’s plan is for evacuating those without private transportation and who can’t reach their emergency contacts. You can also consider investing in a medical alert system that will allow you to call for assistance if you are immobilized. Those who use electric wheelchairs should keep a manual one for backup while those with communication disabilities should come up with a plan to communicate with others in the event you don’t have your communication device (augmentative communication device, word board, etc.). One good idea is to keep key phrases written on paper in your emergency kits and wallet. You should also keep an emergency health card with personalized essential care information in your wallet. Know how to turn off your water, gas and electricity, and print instructions with this information for your family, caregivers and emergency responders to follow if and when necessary. You should also keep instructions for any medical equipment you use attached to said equipment. Finally, prepare both a home emergency kit and a travel emergency kit. Your emergency kits should include first-aid supplies, a battery-powered source of light, a radio, extra batteries, any medical equipment, assistive devices and over-the-counter and prescription medication you need, in addition to water and nutritional survival food. Remember: those with service animals also need to include pet survival essentials in their kits. Also, SOS Survival Products carries an evacuation chair with extended handles to help transport a person safely down stairs, a manual wheelchair, and other medical supplies to help you respond during an emergency. Have your own disaster survival tips for people with disabilities? Share them with us in the comment section below!